The railroad transformed 19th century America, facilitating long-distance travel and the efficient transfer of raw materials to factories and agricultural and manufactured goods to markets. For Frederick this transformation began in 1831 when the nation's first railroad, the Baltimore & Ohio, opened a branch line to the city. The first B&O depot stood east of South Carroll Street. census indicated that 236 inhabitants lived in the area. Of these, thirteen were employed by the railroad, seven by the Frederick Brick Works, and ten by the Union Manufacturing Company, a hosiery mill. As technology and the economy evolved, many of the factories closed, and the neighborhood entered a period of decline. With the opening of the MARC branch line, the Lower Depot Neighborhood found new life in a new century. 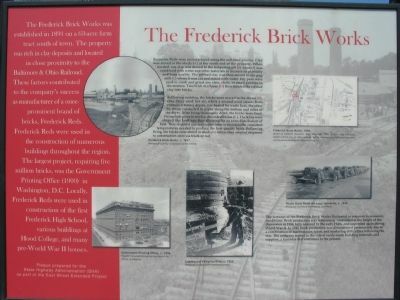 The Frederick Brick Works was established in 1891 on a 63-acre farm tract south of town. The property was rich in clay deposits and located in close proximity to the Baltimore & Ohio Railroad. These factors contributed to the company's success as manufacturer of a once-prominent brand of bricks, Frederick Reds. Frederick Reds were used in the construction of numerous buildings throughout the region. The largest project, requiring five million bricks, was the Government Printing Office (1900) in Washington, D.C. 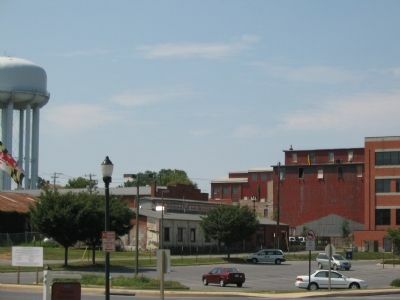 Locally, Frederick Reds were used in construction of the first Frederick High School, various buildings at Hood College, and many pre-World War II houses. using the soft-mud process. Clay was stored in the sheds (A) at the south end of the property. When needed, raw clay was moved to the tempering pit (B) where it was combined with water and other materials to increase its plasticity and burn quality. The refined clay was then moved to the pug mill (C) where it was cut and mixed with water. Dry pans were used to crush and grind any slate, shale, or small pebbles in the mixture. Two brick machines (D) then molded the refined clay into bricks. Following molding, the bricks were moved to the dryers (E). One dryer used hot air, while a second used steam. Both contained tunnel dryers, one heated by waste heat, the other by steam conducted in pipes along the bottom and sides of the dryer. After being thoroughly dried, the bricks were fired. Firing took place in twelve, downdraft kilns (F). The kilns were shaped like beehives, thus allowing for an even distribution of heat. They required constant supervision to maintain the consistent temperatures needed to produce the best quality brick. Following firing, the bricks were stored in sheds (G) where they awaited shipment to construction sites via truck or rail. Red letters on the right are keyed to the text of the sidebars. by the early 1940s, and suspended again during World War II. In 1946 brick production was discontinued permanently due to a combination of maintenance, labor, and marketing difficulties following the war. The company turned to the sale of ready-made building materials and supplies, a business that continues to the present. Plaque prepared for the State Highway Administration (SHA) as part of the East Street Extended Project. Location. 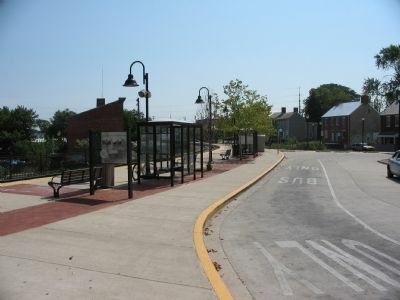 39° 24.699′ N, 77° 24.315′ W. Marker is in Frederick, Maryland, in Frederick County. Marker is at the intersection of B & O Avenue and South East Street, on the right when traveling west on B & O Avenue. Touch for map. Located at the passenger platform for the Frederick Terminal of the MARC. Marker is in this post office area: Frederick MD 21701, United States of America. Touch for directions. (approx. 0.2 miles away); Civil War Hospital Center (approx. ¼ mile away); The Everedy Company (approx. ¼ mile away). Touch for a list and map of all markers in Frederick. More about this marker. Images on the North Side include a drawing of "Atlas at Frederick by H.D. Stitt, 1927." 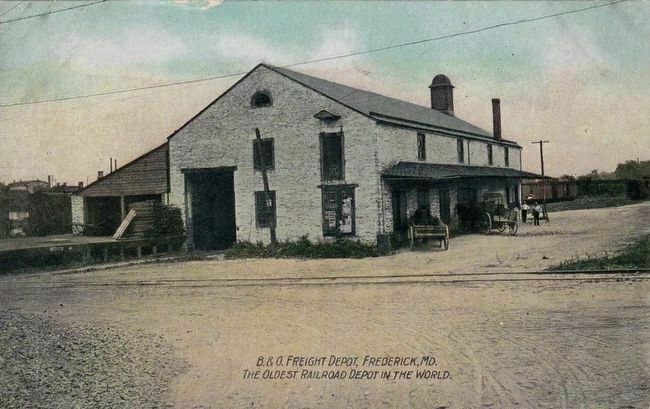 Photo A is of the "Freight Depot, c. 1911. Following construction of a new passenger station in 1854, the original 1832 depot was converted to a freight facility. Doorways were cut into the gable ends, and a railroad was run through the building. The building was later demolished." Photo B is the "Frederick Branch and Dwellings along B&O Avenue, c. 1911. These buildings still exist along the south side of B&O Avenue." 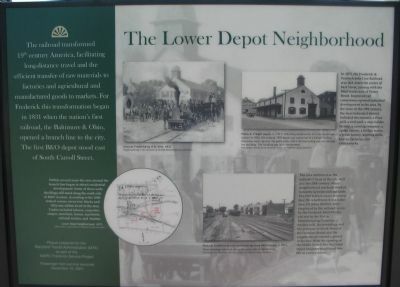 A map of "Lower Depot Neighborhood, 1873" carries the caption, "Within several years the area around the branch line began to attract residential development. Some of these early dwellings still stand along the south side of B&O Avenue. According to the 1840 federal census, seven free blacks and fifty-one whites lived in the area. Trades included laborer, carpenter, cooper, merchant, tanner, machinist, railroad worker, and teacher." 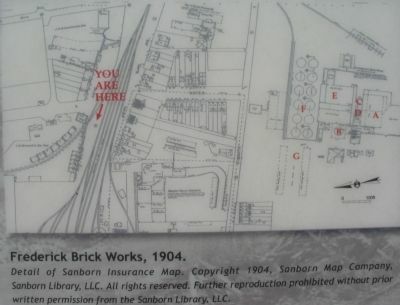 The South Side displays a diagram of "Frederick Brick Works, 1904" from a Sanborn Insurance Map. Photographs include "Frederick Brick Works, c. 1897," "Government Printing Office, c. 1936," "Loading and Firing the Kilns, c 1932," and "Trucks Stand Ready for Local Deliveries, c. 1940." Buildings of the old Lower Depot are giving way to commuter parking lots and city improvement projects over time. Some still stand as reminders, however. More. Search the internet for The Lower Depot Neighborhood / The Frederick Brick Works. Credits. This page was last revised on June 16, 2016. This page originally submitted on October 7, 2007, by Craig Swain of Leesburg, Virginia. This page has been viewed 3,130 times since then and 10 times this year. Photos: 1, 2, 3, 4, 5, 6. submitted on October 7, 2007, by Craig Swain of Leesburg, Virginia. 7. submitted on November 12, 2015.